DETROIT—With growing membership, a budget back in the black and a strike fund that is rising by the year, the Auto Workers are much stronger than they were four years ago, retiring union President Dennis Williams says. Williams gave his address as the UAW prepares to undergo a massive leadership change. Williams, Secretary-Treasurer Gary Casteel, Vice President Jimmy Settles and Executive Board members Chuck Hall of Detroit (Region 1) and Julie Kushner of New York City (Region 9) are all retiring. 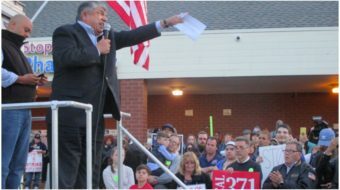 Delegates will vote on new leaders on June 13, while taking time out for a speech by AFL-CIO President Richard Trumka. Meanwhile, outspoken dissident Gary Walcowicz is trying to gather signatures for an insurgent campaign for the union presidency. The day after, June 12, another prominent Detroit union leader, Teamsters President Jim Hoffa, told delegates his 1.4-million-member union stands in solidarity with UAW, and will when the Auto Workers face bargaining next year with the Detroit 3. “I hope there’s not a strike, but we will be with you all the way if there is,” he said, to cheers. And UAW delegates voted on a long resolution on the changing economy – and on whether to continue a dues increase, approved at the last convention four years ago. 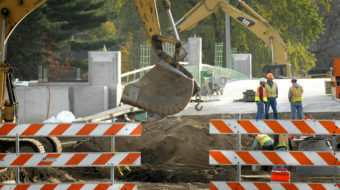 The hike, combined with cost-cutting, returned UAW to financial solvency, Williams said. The solvency and the membership growth, from 350,000 at its depth to “more than 430,000” now, were among his highlights. When he took office, Williams said in a separate statement, UAW was $30 million in the red. Not only is the budget in the black, but strike fund figures posted on the web by Automotive News reporter Mike Weyland show the fund had $721 million as of the end of 2017, $98 million more than four years before. The union’s slump hit bottom in 2008-09, when two of the three big Detroit car companies, GM and Chrysler, declared bankruptcy, auto parts suppliers were staggering or failing and the rest of the country was reeling from the crash, caused by Wall Street’s financial finagling. The GOP George W. Bush administration was reluctant to aid the auto firms, and several top Southern Senate Republicans – whose anti-union states lured foreign “transplant” auto plants with promises of big tax breaks and no unions – openly rooted and lobbied for the death of the Detroit automakers and the UAW with them. President Obama hammered out a rescue package, which included UAW agreement to a 2-tier wage system. The latest pacts with the Detroit 3, which Williams’ team negotiated, abolished that system and provided healthy raises, he reminded the delegates. But the union still faces organizing problems. The convention’s 2,000 delegates spent much of their opening day discussing the issue. 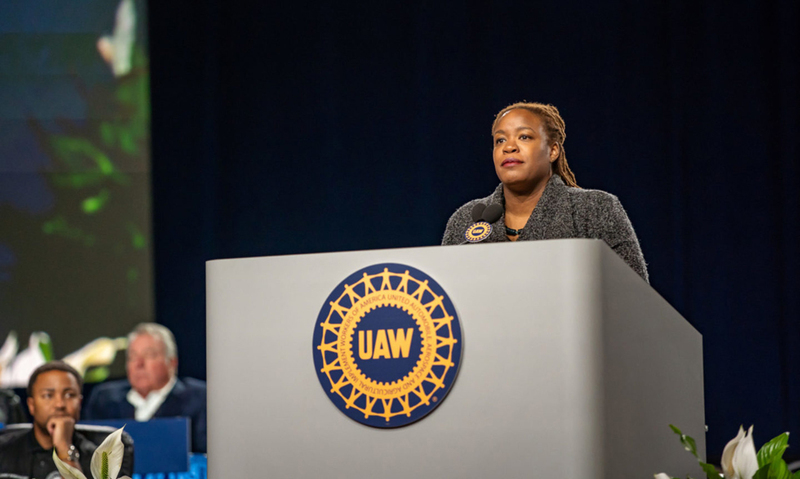 Convention delegates passed an organizing resolution that pledges to “maintain and enhance the commitment of UAW resources to organizing” – without saying how much. “Wages and benefits of non-union workers are negatively affected without the right to organize,” delegate Teresa Menendez reminded her colleagues. And the delegates’ resolution told their union to “develop collective bargaining strategies that have a direct impact on organizing” and vice versa. It also ordered the union to improve its communications, and especially on social media, with its members. “We need to keep persisting in organizing the South – and everywhere else,” said Kushner, whose region just celebrated organizing 5,000 research assistants and teaching assistants at Harvard University. That’s despite a recent big loss at the Nissan plant in Mississippi, which Williams admitted. “In my region, we have technical and professional workers. We have 10,000 contingent faculty, TAs, RAs and adjunct professors. But we can organize even more, in museums, legal services, publishing and even the public sector,” Kushner pointed out. To a great extent, organizing outside the auto industry, what the UAW has been doing. Its most recent organizing win, which Williams announced from the stage, is among 950 game dealers, poker dealers and dual rate workers at the MGM Grand National Harbor casino hotel in Prince George’s County, Md., right on the southern border of the Nation’s Capital. 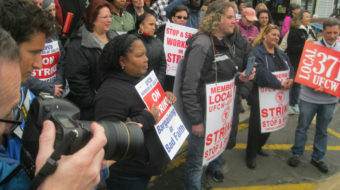 Including TAs, RAs, scientists, Michigan government workers, writers, nurses, casino workers in Connecticut and other workers, some 40 percent of UAW’s members are now not auto and auto parts workers, union communications staffers estimated. Organizing also slid over into political action, as delegates passed a resolution urging increased member voluntary contributions to the union’s campaign finance committee, UAW-V-CAP and increased involvement out on the hustings, including running for office on a very progressive platform. 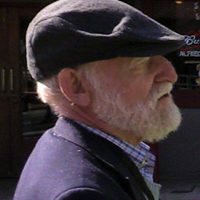 “What we have gained at the bargaining table is steadily being taken away at the state and national level” in politics, said Local 699 Retirees member Carol Chisholm of Saginaw, Mich.
“We have to elect working class people…to build a socialized health care system, stop destructive wars and rework the criminal justice system,” among other goals. Williams tackled several other issues in his address. He reiterated UAW’s commitment – which some members have questioned on social media – to a renegotiated North American Free Trade Agreement (NAFTA). The dissenters want to scrap NAFTA entirely. UAW, like the AFL-CIO, is campaigning for a new NAFTA that includes strong and enforceable worker rights in all three countries, abolition of a secret pro-business trade court whose judges can override pro-worker laws and whose decisions can’t be appealed, and enforceable wage increases in Mexico. The UAW also wants higher domestic content on cars imported into the U.S. from Mexico. Otherwise, Williams said, U.S. factory migration south of the border – including, though Williams did not say it, car plants of the Detroit 3 – will continue. And so will the race to the bottom, he warned.